And I love Father Mark. He is a lifelong figure of love and kindness in my life. I was fortunate. He was not like everyone. Johnny has had his deep sorrows. And he mentions it. And it is painful for everyone. But he is able to recognize love and happiness. His portraits are alive with the personalities of his loved ones. He shows his skill and his personality emerges. IAM so impressed with our hometown sweetheart Johnny Soap! Oh he is clever and he has been through it, but he is squeeky clear about his views in this interesting show. 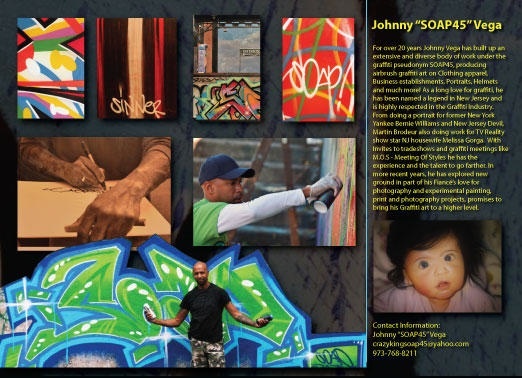 Johnny emerges as an graffiti artist blossomed into full fine art icon of his hometown, Paterson. Please join us in welcoming Johnny to the Ivanhoe and celebrate his “re-entry” party as the worldly father juxtaposing the trendy graphics of graffiti and the inner sanctity of an artist as he lets it out. Good Luck Johnny! You are very special to our scene. Exhibiting June 3rd through June 30, 2011. And thank you Mohammed for a great show, thanks all for an amazing but grueling experience at the Paterson PM! Thank you all the MacCrackens! 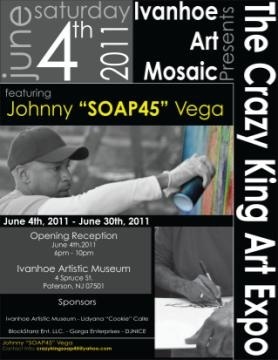 This entry was written by Ivanhoe Artists, posted on June 3, 2011 at 12:28 PM, filed under Ivanhoe News. Bookmark the permalink. Follow any comments here with the RSS feed for this post. Both comments and trackbacks are currently closed.